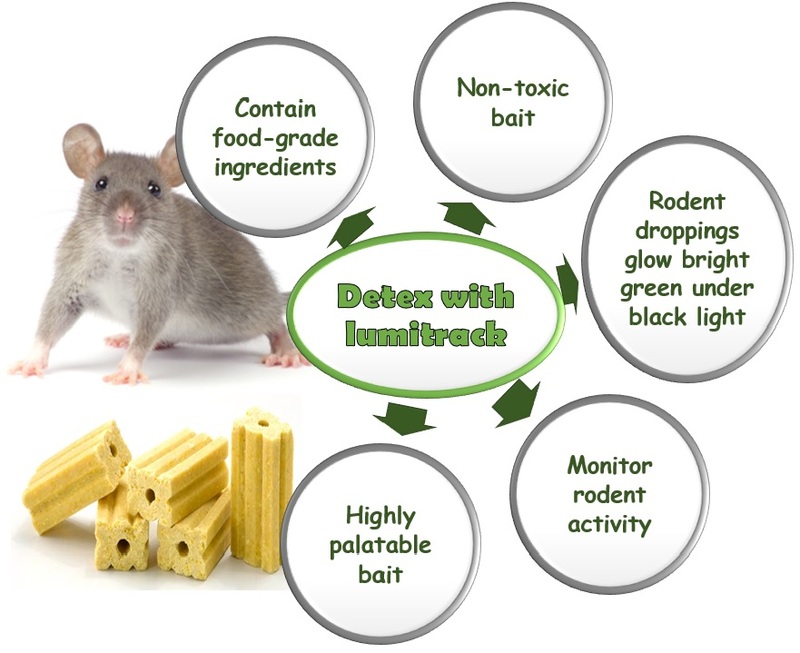 Bell's popular monitoring bait, DETEX BLOX, is now reformulated as DETEX with Lumitrack, a non-toxic bait with a special additive that makes rodent droppings glow bright green under black light. DETEX with Lumitrack continues to be an indispensable tool for monitoring rodent activity but now it can also be used to track rodent movement and to identify rodent harborage. Droppings from rodents that have consumed DETEX with Lumitrack apear normal under regular light but glow a bright neon green under black light. By tracking those droppings, PMPs can identify the specific species and size of an infestation, as well as track rodent movement to harborage and nesting areas. Active burrows become visible under black light, as well. New DETEX with Lumitrack is ideal for monitoring rodent activity in schools, food warehouses, zoos, parks and other sensitive accounts. Once rodent activity is detected, PMPs can replace the non-toxic bait with Bell's rodenticide baits, traps or other rodent control products to get rid of an infestation. The 20g BLOX is made with Bell's highly palatable bait formulation containing food-grade ingredients. Because its many textures and tastes appeal to rodents, DETEX with Lumitrack gives technicians the same excellent bait acceptance and weatherability as other BLOX baits from Bell.